IDF increases deployment by Gaza border as Hamas plans 'Nakba Day' riots. The IDF has completed its preparations for the clashes expected along the Gaza border over the next few days coinciding with the relocation of the US embassy from Tel Aviv to Jerusalem and the 70th anniversary of Israel's independence on Monday, and the 'Nakba Day' of mourning observed by many in the Palestinian Authority and Hamas-ruled Gaza Strip. 'Nakba,' or catastrophe, is the term used by Palestinian Arab organizations such as Hamas and the Palestine Liberation Organization to refer to the creation of the State of Israel on May 14, 1948. 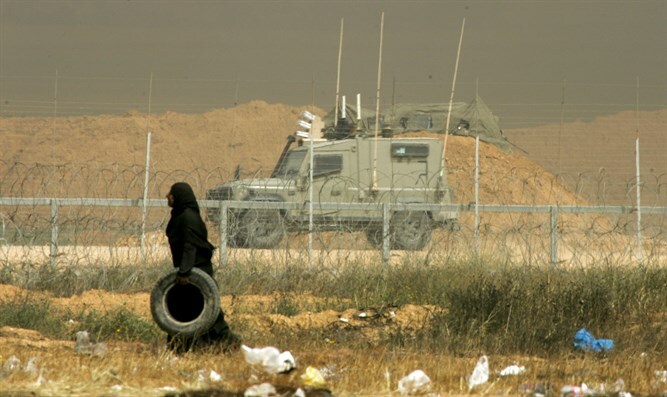 The IDF preparations for Nakba Day riots include increased deployment of combat battalions on the Gaza border, special units, intelligence gathering forces and snipers.In addition, the Central Command will be reinforced by a number of combat battalions and intelligence gathering teams. As part of preparations for this week, the regular combat forces' training ceased, and most of the efforts will be directed to dealing with the violent disturbances. IDF Spokesperson Ronen Manlis stressed that "the IDF is ready and prepared for a broad range of scenarios and is determined to defend the residents and sovereignty of Israel." Israel Air Force planes have dropped leaflets warning Gaza Strip not to approach the security fence, not to attempt to damage the fence, and not to attempt to carry out any attacks. The leaflet states: "Recently, Hamas has been waging violent and terrorist activities against the State of Israel along the Israeli-Gaza border. Hamas hides its many failures and endangers your lives. At this time Hamas is stealing your money and using it it to dig tunnels at your expense. You deserve a better government and a better future." "The IDF is warning you not to come closer to the fence, and the IDF is determined to protect the citizens and sovereignty of Israel against the Hamas terror attacks under the auspices of the violent disturbances. Do not approach the fence and do not participate in this Hamas show that puts you in danger. The security establishment explained that Hamas is exploiting the disturbances in order to carry out acts of terror under the cover of the mass demonstration, to damage the infrastructure of the fence and to carry out attacks in Israeli territory. The IDF spokesman said that "Hamas is dragging the public in the Gaza Strip into a violent incident against its will. Hamas is responsible for everything that is happening in and comes out of the Gaza Strip, and in light of this, it bears overall responsibility for the events and their consequences. The IDF will not allow harm to the security of Israel's citizens and its defense infrastructures and will fulfill the duty of protecting the citizens of Israel."